Mom365 Shares the Joy Created by Capturing Life’s Most Treasured Moments on Modern Living with kathy ireland ®. Every baby deserves a beautiful photo is the passion that drives more than 1,800 Mom365 Photographers. Tune into E! Entertainment Network as sponsored programming on December 10, 2015 and Bloomberg International as sponsored programming on December 27, 2015. Founded in 1947 and headquartered in St. Charles, MO outside of St. Louis, Mom365 employs more than 1,800 professional Photographers to capture, celebrate and preserve the family’s most cherished memories of welcoming a new baby. Partnering with more than 1,400 Hospitals around the country, Mom365 operates under the vision that “Every baby deserves a beautiful photo.” In fulfillment of this belief, the company provides more than one million free photo sessions of newborns and new mothers each year. Over the past two decades, more than 60 million photographs and keepsakes have been provided for free. Mom365 also sends out more than a million e-newsletters each week with advice and age-based information. The topics range from care for the newborn child to helping to raise the toddler. Through its Mom365 Foundation, the company has also donated more than $250,000 to families in need. The Vice President of Programming of Worldwide Business, JL Haber, notes, “We find our viewers especially enjoy our stories that show companies such as Mom365 that provide innovative products and services while meeting very real human needs. Tune in to see Mom365 on E! Entertainment Network as sponsored programming on December 10, 2015 at 6:30am ET/PT and on Bloomberg International as sponsored programming on December 27, 2015 at 8:00am CET. Modern Living with kathy ireland ® is a weekly business television program featuring real-world insights from corporate executives from all over the globe. 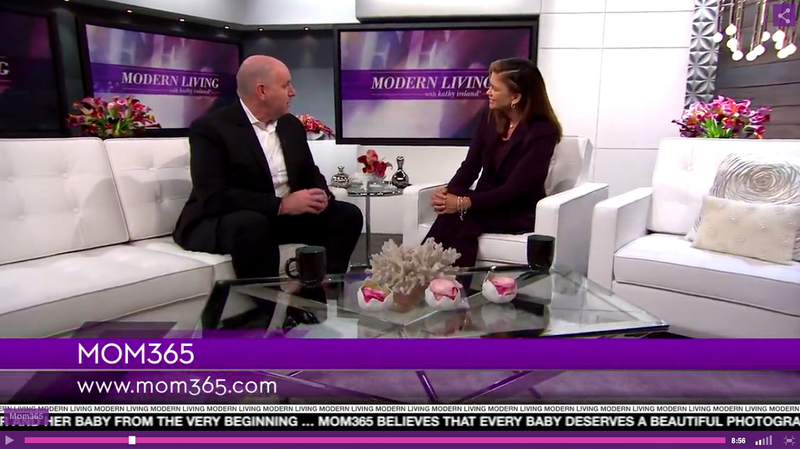 Modern Living with kathy ireland ® airs Thursday mornings throughout North America on E! Entertainment Network as part of their sponsored programming lineup and in over 50 countries throughout the world on Sundays on Bloomberg International as part of their sponsored programming lineup. Mom365 captures one of life’s most treasured moments for millions of moms and newborns without charge.